The full transcript of Software Diagnostics Services training. Feel frustrated when opening a software trace with millions of messages from hundreds of software components, threads and processes? Go beyond simple CPU and disk hog monitoring or searching for errors in a text and learn how to efficiently and effectively analyze software traces and logs from complex software environments. 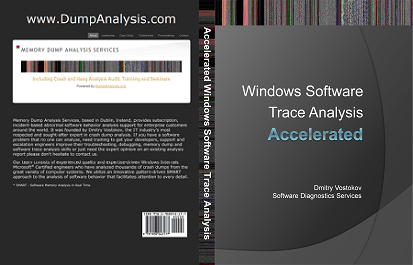 Covered popular software logs and trace formats from Microsoft and Citrix products and tools including Event Tracing for Windows (ETW) and Citrix Common Diagnostics Format (CDF). This course teaches using pioneering and innovative pattern-driven and pattern-based analysis of abnormal software behavior incidents developed by Software Diagnostics Institute. When you purchase the PDF book you additionally get free named Software Diagnostics Library membership with access to more than 150 cross-referenced patterns of trace and log analysis. There is an option to buy 11 volumes of Memory Dump Analysis Anthology in PDF format together with the course.